It's certainly not a looker, but can this printer impress elsewhere? It’s expensive, but the Epson is fast, practical and produces extremely bright and vibrant prints. The handle, speed, paper capacity and CD writer make it great for parties. Dear oh dear, the Epson looks more like a mop bucket than a printer! Its slab-sided design, muted grey finish and crude-looking buttons are worrying, given that it's the most expensive printer on test. However, its rugged wipe-clean design means it's the most practical of all for parties and other events where people want instant souvenirs and lots of them. 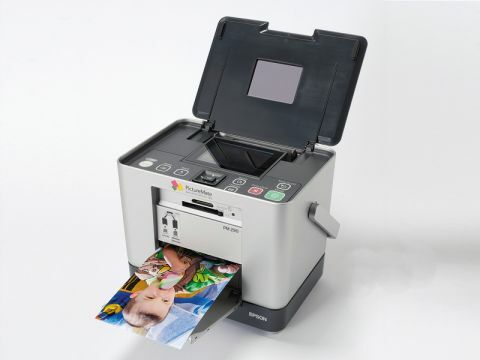 It incorporates a CD-writer, too, for guests who want digital images rather than prints. The LCD is a good size, and it's sharp and contrasty, though images took a few moments to render at full resolution. Our print times were around 43 seconds, which is only four seconds longer than the 39 seconds quoted, and the results are terrific. Contrast, saturation and perceived sharpness were very high, and the Epson produced the most striking portrait shot of all, though the blue sky in our landscape shot looked a little grey and flat.